One of the main attractions near Bandung, Tangkuban Perahu or Overturned Boat - see/click the rare picture on the right (taken from the air over the airport) - ("Perahu" means boat in Bahasa Indonesia) is named because of its shape and also because of the famous local legend of the Sundanese Prince Sangkuriang, which illustrates the volcano's origin. 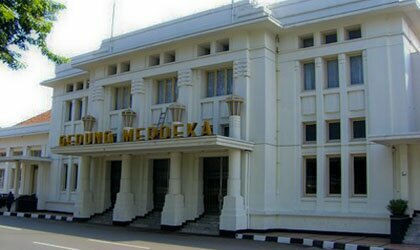 It is situated at about 30 kilometers [18.6 miles] to the north of Bandung airport or 25 kilometers [15.5 miles] from the city center. This is a must-visit attraction near Bandung. There are three "kawah" (craters) on this volcano. The biggest crater, called "Kawah Ratu", lies at 2,084 meters (6,837 feet) above sea level. Reportedly it erupted in 1826, 1952 and 1969. The other craters, "Kawah Upas", which culminates at 1,830 meters [6,004 feet] a.s.l., erupted in 1536 and "Kawah Domas" (1,650 meters [5,413 feet] a.s.l.) erupted in 1971. 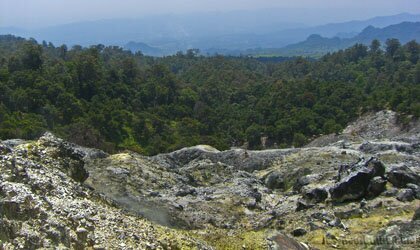 Apart from two famous major craters, Ratu and Domas Craters, Tangkuban Perahu also has Upas Crater and Cikahuripan Cave. Cikahuripan Cave is quite dark, if you are interested in exploring the cave, you will need a torch, which can be borrowed at the entrance of the cave for Rp. 1,000. If you arrive in the early morning, Tangkuban Perahu can be quite chilly, 7-9°C (around 48° F) and it will rise to 17°-23°C (63°-73° F) during the day (wearing a sweater or jacket might help) and usually Tangkuban Perahu becomes foggy in a cloudy morning. There is a tourist information centre available at Kawah Ratu, just opposite a police station. Shops selling local souvenirs are also available. If you come without a tour group, there are 75 local guides available, who work in shifts. These guides will approach you as soon as you get out of your car or bus. Official local guides have an identification card (most of the time they also wear their official jackets with "Local Guide Tangkuban Perahu" written at the back). If you are not sure, you can go to the Tourist Information Center. The official local guide will cost you approximately Rp. 250,000/hour for foreigners and Rp. 250,000 for a full tour around Tangkuban Perahu volcano for local tourists. Approximate touring time from Kawah Ratu to Kawah Domas, including explanation, photo taking and having a short rest is about two hours to two and a half hours. It all depends on your pace, curiosity and so on. The best time to visit is during the dry season (May-November). Early departure in the morning from Bandung city is advisable to avoid traffic congestion. In the wet season, especially December and January, it can be too foggy and the track down to Kawah Domas can be very slippery. More about the climate of Indonesia is available here: "General Information Indonesia". Tangkuban Perahu is a must see! Bandung is also famour for shopping. 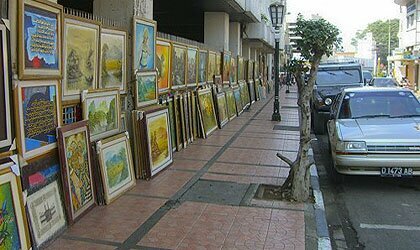 The city offers worth a visit galleries.